Offering you a complete choice of products which include ss wall mounted sink unit. 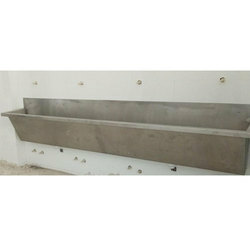 We are ahead of our competitors in the industry for supplying and retailing a huge gamut of SS Wall Mounted Sink Unit.These large sized units are made using stainless steel and modern technology tools that make them more qualitative and improve their quality. Our range is free from any defect and widely acknowledged for their abrasion resistivity, strong construction, and robust designs.